In the link below you will find a hughe collection from community/costom Map Musik files (622 .ogg files). You can find the files also seperate in thousands of different mapzips. UT-servers normaly don't force you to download musik files so when you not put them manualy inside the folder you will not hear the MapMusik. - Jefejefejefe from DISASTROUS CONSEQUENCES for uploading a huge part of them. He also modified some of the original files to longer versions with a mix from the same theme. - GLoups! for delivering another bunch of files. - Turbo K from OMNI also for delivering another bunch of files. - Myself from CEONSS for grazing redirects and mapzips. - Binger for the will to deliver his files. You can just copie the whole folder content in your ..\UT2004\Music folder. As written there are some longer versions from original files in the folder (don't worry it will not create any mismatch on servers). When you have musik files which are not in the list than please either send them to me and I will put them to the files, or link them here as well. Here are a few more. I don't have many, but it looks like a few that are not listed. Oops, I forgot about this when we got involved with the stargate map conversation. I'll have a look but I think I only have a small number that you didn't. I'm doing some cleanup on my backup drive. Probably going to delete a lot of UT stuff. 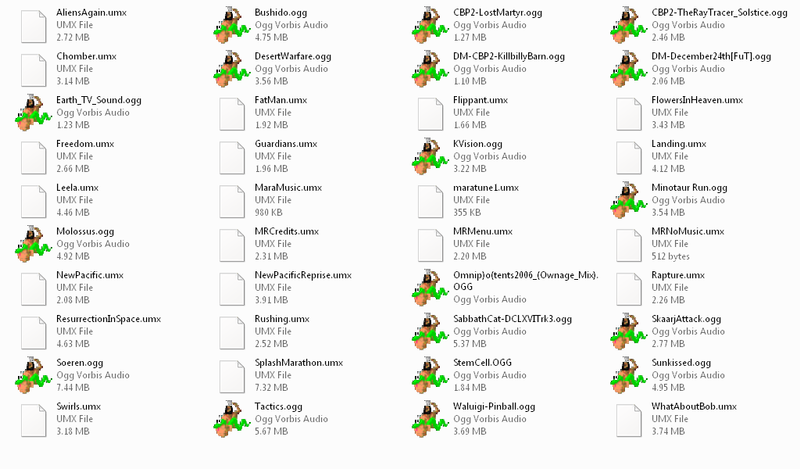 I don't have the instructions you sent me for this so here is a screenshot of the music files that I have. If there are any you don't have and are still interested then let me know. They are all already in that zip file, but the .UMX files. But that are no UT2k4 musik files. They are may for the old unreal files.